Forum Journal is made available to you (select pdf on image above) courtesy of the Preservation Leadership Forum of the National Trust for Historic Preservation. The National Trust for Historic Preservation sponsored a workshop, Industrial Heritage Retooled, in mid-November 2010 at the Potantico Conference Center, the former Rockefeller estate. The workshop was co-sponsored and supported by the J.M. Kaplan Fund and the Rockefeller Brothers Fund. 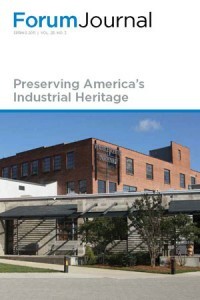 The theme was the past, present and future of industrial heritage preservation. Highlights of this workshop were published in the Fall 2010 issue of SIAN (Vol 39, No 4). In the spring of 2011, the Trust dedicated an issue of their Forum Journal to papers presented at the workshop. Recently, the Trust gave the SIA permission to provide the issue as a PDF™ as a service to SIA members and friends. The SIA appreciates this opportunity to circulate this document to the IA community.